"Little and fat and delicious with coffee, tea, etc." Stir together flour and baking powder and set aside. Beat together eggs and sugar in a large bowl until well blended. Stir in butter, extracts, black walnut flavoring and the walnuts. Gradually stir flour mixture into creamed mixture, blending well. Divide dough on a floured surface into 8 equal portions. Roll each portion into a 14 inch rope. Place four ropes about 2 inches apart on greased cookie sheet. Bake in a 325 degree F (165 degree C) oven for approximately 20 minutes, until bottoms are pale gold in color. Let cool about 2 minutes on the baking sheet. Use a serrated knife to cut each rope on a diagonal into slices 1/2 to 3/4 inch thick. Lay slices close together on their sides and bake at 375 degrees F (190 degrees C) until lightly toasted (approximately 15 minutes). Cool completely on the baking sheet. Store airtight. This is so good and won the approval of a child and an 85 year old woman. Need I say more! Better than any biscotti I've ever bought. We used fresh black walnuts in our recipe. This was the first time I tried making biscotti. Found this recipe to be easy and versatile - used pecans and craisins the first time and golden raisins and walnuts another. Great! I made a little variation of this one...I used 1.5t vanilla and 2.5t maple flavor to make my own maple walnut biscotti. Oh soooo good. Made a lot of cookies!!! 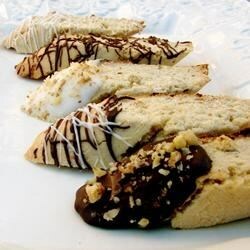 This biscotti tastes terrific. It's not as crunchy and hard as most biscotti though. Kind of crumbly and soft, even when well-toasted. I love the flavorings and may use them in another recipe.